Here are some healthy salad recipes, some passed down from generations but also including our newest and latest artisan creations. I love the thought of starting a collection of healthy recipes. It will take us a little time to post them all but eventually we will have a variety that will make healthy meal planning easy and weight loss even easier. 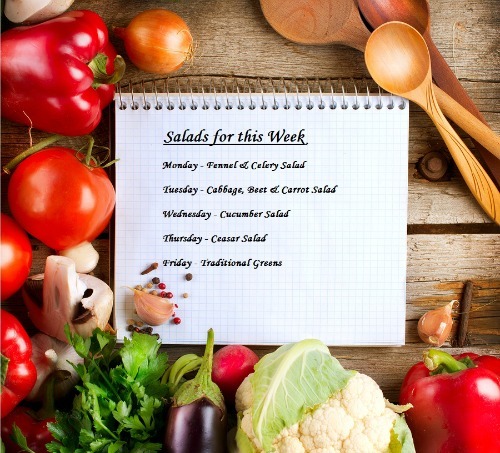 Salads are important for our health and weight loss success, mainly because they are made with a variety of vegetables which offer lots of vitamins, minerals and nutrients and many are loaded with antioxidants that can help improve liver function. I cannot stress this point enough because the healthier your liver is the easier the weight loss. These healthy foods also provide a great deal of fiber that may help with numerous health issues such as constipation, blood sugar levels, cholesterol and heart disease. Oh, did I forget to mention that they are also high in water content and low in calories. With all the food changes that have developed in the last couple of generations it is sure a heck of a lot easier to put on the pounds. Food has become faster, unhealthier and processed to death. So check out our healthy salad recipes below and perhaps they can become part of your daily meal plans. Not only is this salad made with liver loving foods but it also makes a delicious low calorie appetizer and a welcomed addition to any weight loss menu. This recipe is mouth watering and not only is it topped with shaved parmesan cheese but it also provides things we need to help with weight loss. This recipe gives you a nice break from all those heavier foods indulged over the holidays. It’s a great dish to start off the New Year as its mouth watering, refreshing, healthy and low in calories, need I go on? This recipe tastes decadent but has fewer calories and is made in minutes. It’s so fast yet perfect for dieting and tasty enough for entertaining. This recipe was created in the sixties and is a big hit during the summer. Great for picnics, entertaining and a loved meal the kids can scoop out for themselves on busier days. This recipe has got to be one of the easiest salads you can make that helps the liver and adds much needed fiber to our diets. Talk about lunch friendly. This salad is low in calories, packed with protein and fiber, which makes it filling, healthy and perfect for weight loss. This liver loving recipe is easy to make and a nice change from your traditional potato, plus we’ve added two different types of dressings to please all taste buds. Love this recipe as it offers zesty and warm bursts of flavors. We all know how important eating spinach has become as this vegetable offers buckets of nutrition and antioxidants. So when making this healthy salad we like to keep it as traditional as possible, making it with Kalamata olives, just as they do in Greece. This recipe is super friendly on the pocket book, yet makes a healthy and filling meal. Comes in handy if you're ever strapped for cash or don't have time to hit the grocery store. This recipe is easy to make and here's why it makes a great dish for weight loss. Do You Have a Healthy Salad Recipe Creation of Your Own? Wouldn’t it be wonderful to have a page dedicated to your very own salad creation? We would love to post your pictures and hear about your recipe/story. We are creating a collection of salad recipes, both yours and ours, with each worthy recipe having its own featured website page. So if you have a creative flare and a recipe worth sharing we would love to hear from you.